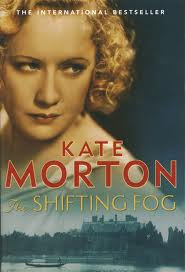 After reading Kate Morton's sensational novel The Forgotten Garden - and giving it 5 stars - I couldn't wait to sink my teeth into The Shifting Fog, also known (and printed in other countries) as The House at Riverton. In the beginning of the novel, the reader is aware that there is going to be a shooting at the lake at Riverton Manor and a famous young poet will die - presumably by suicide - but we're not quite sure why. We meet Grace, who was employed as a servant at Riverton Manor at the young age of 14 and was ensconced in the household during this period. When Grace is in her late 90's and living in a nursing home, she is contacted by a film maker looking to make a film of the events leading up to the suicide. The film maker has researched the characters and the period, and asks Grace for her input to ensure the sets are an accurate portrayal of the manor during the roaring 1920's. Grace begins to reflect on her time at the manor; observing sisters Hannah and Emmeline and the secrets she has protected since then. We are taken back to the period in long vivid flashbacks, and become immersed in the house and entranced by the characters. The book is very gothic in its setting and rich in secrets, long kept loyalties and a sense of tradition. We also witness the slow decline of Riverton Manor and the changing social landscape following World War I and the devastation that came with it. Grace reveals the truth about the young poet's death at the end of the book, and for me it came as a complete surprise and I'd go so far as to say it was even haunting. As a result, we learn why sisters Hannah and Emmeline never spoke to each other again after that night. Kate Morton has used a similar plot design as she did in The Forgotten Garden - two different time periods, characters haunted by the past, family drama, mystery and secrets slowly revealed - however it's such a magical and effective concoction and I enjoyed it very much. I have to say I preferred The Forgotten Garden, however the suspense and mystery in this novel had me completely gripped. I would highly recommend The Shifting Fog to other readers.